The software below was developed specifically for WILD. Some of it is based on previous work by the partners. In general, our software is available under an open-source licence but since it is so specific to WILD, you have to contact the authors directly. PhotoTreillis can display arbitrary image files (TIFF, JPEG, PNG, etc.) as well as PDF files on the wall by scaling them (up or down) to fit the screen. We routinely use it for slideshows during presentations. To optimize the display, the scaled version of the tile displayed by each machine are cached on that machine, resulting in extremely good performance. This middleware is used to interface with the VICON tracking system. VICON Tracker provides an OSC (Open-Sound Control) interface to track objects with the VICON (we use OSC for a number of other devices as well). Screen Calibrator is a set of tools to facilitate the registration of the screens and multitouch table so that other application know where the components are in the room. ZVTM/ZUIST is a toolkit for creating post-WIMP zoomable interfaces. The zvtm-cluster module allows any application written with ZVTM to run on the WILD wall. VizMaster, a prototype application developed for the VIzMaster video (see the "videos" page). WILD Input Server is used to configure the various input sources available in WILD (VICON, iPod Touch, multitouch table , gyroscopic mouse, etc.) and provide a unified API to applications. It is based on ICON, a system formerly developed by members of the project. ICON provides a visual language to create input configurations. By abstracting out the physical devices, it makes it easy to try different devices without modifying the application. For example, one can develop and test a new application without using WILD, e.g. by using a Wii controller, and then change the configuration to use the VICON tracker when in the WILD room. 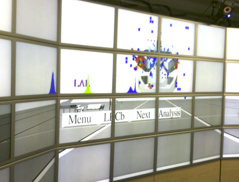 WebWall displays an array of 32 to 256 web windows on the WILD wall (1 to 8 windows per screen), and provides a set of OSC commands to load a page in any window, highlight a page, swap it with another page, etc. This is used to prototype a variety of applications. For example, we have used it to display and manipulate brain scan images for the neuroanatomists from LNAO, before we created the SubstanceGrise full-fledge application (see below). We have also used it to assign the papers to committee members for one of the CHI 2010 conference subcommittees (140 papers, 13 committee members): we allocated one column per committee members and assigned papers simply by moving them to the right column. 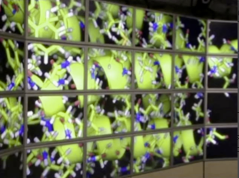 WILDMol is a modified version of PyMol, a system used by chemists and biochemists to display complex 3D molecules. 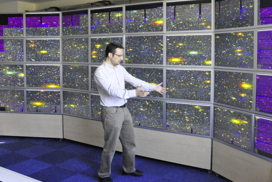 WILDMol can display any molecule on the full wall by running replicals of PyMol on each machine and synchrosizing their cameras. Using the VICON motion tracker, we can move and orient the molecule. 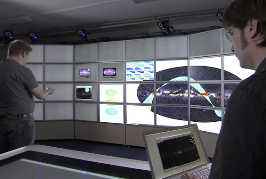 SoWILD is a collaboration with LAL to display and navigate a 3D representation of the Large Hadron Collider at CERN as well as the trajectories of the particles as they are detected and other relevant data. Substance is a middleware that facilitates the development of multi-surface applications, i.e. 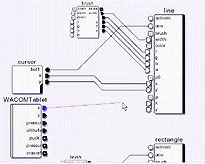 application that run on multiple computers and manage a variety of input and output interaction surfaces such as displays and touch-sensitive devices. It is based on a data-oriented approach that separates data from behavior and a generalized notion of sharing. See the Publications page for the paper on Substance published at the ACM CHI 2011 conference and the Projects page additional information. Source code is available at substance-env.sourceforge.net. 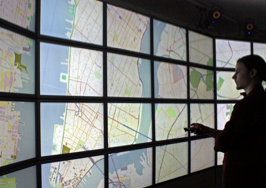 We have used Substance to create SubstanceCanvas, an application that can display arbitrary content on the wall and manipulate it using the multitouch table, laser-like pointing devices, iPod Touch and iPads, as well as regular laptops. 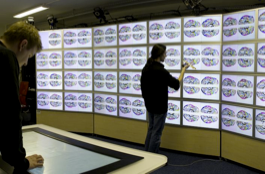 We have also used it to create SubstanceGrise, an application that can display 64 brain scans in 3D using the BrainVisa/anatomist application and that allows the user to control them through a physical brain whose position and orientation is tracked by the VICON system.